Root vegetables can be intimidating. Most of them have thick, strange looking skin and long stems with leaves sprouting out of them. Let’s face it, some of them look like they’re from outer space. Some root vegetables are given the cold shoulder because they have the reputation of tasting earthy and even bitter. But hold up just a minute. This guide to root vegetables will hopefully serve as inspiration to embrace the outcast funky roots. Because they are not only amazing for your health, but they are versatile in the kitchen and absolutely delicious when prepared properly! Roots are some of the most nutrient-dense vegetables in the world. While each root contains its own set of health benefits, they share many of the same characteristics. Yams, beets, parsnips, turnips, rutabagas, carrots, yuca, kohlrabi, onions, garlic, celery root (or celeriac), horseradish, daikon, turmeric, jicama, Jerusalem artichokes, radishes, and ginger are all considered roots. 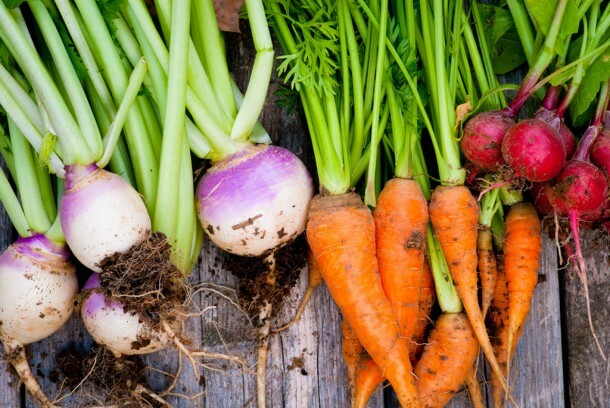 Because root vegetables grow underground, they absorb a great amount of nutrients from the soil. They are packed with a high concentration of antioxidants, Vitamins C, B, A, and iron, which help to cleanse your system. They are also filled with slow-burning carbohydrates and fiber, which make you feel full, and help regulate your blood sugar and digestive system. This little factoid, plus the high-octane nutrients and low calories, make roots excellent for people who are trying to lose weight, or simply stay healthy. Adding up all of the nutrient qualities, root vegetables are disease-fighting, immunity and energy-boosting, and are also extremely versatile in cooking. What is the best season for root vegetables? Most root vegetables are available year round, but their peak season is fall through spring, with the exception of beets, which are best summer through fall. When in-season, roots have a deeper, sweeter flavor and tend to be juicier, but they are one of those plants that seem to stay consistently great all year long. How do you choose roots? Selecting good root vegetables is the opposite of selecting good fruit–the harder, the better. They should be smooth and free of gashes or bruises. When choosing roots that come with leafy greens (a bunch of beets, for example), make sure the stems and leaves of the greens are firm and bright. How do you store root vegetables? While you certainly don’t need to have a root cellar to purchase and enjoy roots, they are best stored in a cool, dark, humid room. When storing them in the refrigerator, keep roots in a paper or plastic bag in the crisper. Storing them uncovered causes them to soften and go bad quickly. What are the various types of roots? Sweet Potatoes & Yams // Among the most usable, user-friendly, and palatable roots, sweet potatoes and yams are great mashed, pureed and made into soup, roasted, and baked into muffins, cookies, pancakes and so much more. They can be used both in sweet and savory applications and are very well-matched with coconut milk, honey, maple syrup, orange, cinnamon, ginger, pecans, cashews, walnuts, raisins, and curry powder. Yams are often confused with sweet potatoes, and although they can be used interchangeably, there is a difference. Beets // Touted as a superfood, beets are among the healthiest foods on the planet. They’re full of beta-carotene and betalains, which are antioxidants and anti-inflammatory. Beets have an earthy, sweet flavor, and are best when roasted, steamed, or left raw and shredded. Golden beets are typically slightly sweeter than red beets. I find citrus (particularly oranges or clementines), blueberries, goat cheese, walnuts, ground cumin, cinnamon, and tahini are excellent compliments for beets. Parsnips // Parsnips have a cinnamon-y flavor and resemble large white carrots (or albino carrots, as I like to call them). They are harder than carrots and have a deeper, warm flavor. I find parsnips are best used in soups, pureed into a mash, or sliced thinly for a parsnip gratin. Parsnips are complimented by nutmeg, cream, and thyme. Turnips // While turnips are versatile, they are very subtle in flavor, which makes them great for pairing with more strongly flavored vegetables. They are great roasted, sautéed, or included in vegetable stir fry. You can also combine turnips with herbs, or use them in tomato-based chunky soups or creamy pureed soups. Rutabagas // Similar to turnips, rutabagas are subtle in flavor. They are harder than turnips and taste a bit more earthy. Best when pureed or roasted, rutabagas go well with herbs, particularly dill, as well as lime and Indian spices. Carrots // Crisp and sweet, carrots are perhaps the most popular root vegetable because they are perfect for eating raw. They match well with just about any vegetable in both cooked and raw applications and can be paired with any spice or herb. Yuca Root // Starchy and subtle in flavor, yuca is often used the same way in cooking as potatoes. It is best when roasted or fried, and it tastes like a potato wedge, although the texture is somewhat stringy. Yuca can be paired with a wide variety of herbs, spices, cheeses, and sauces. Kohlrabi // Underneath the thick skin and strange tentacles of kohlrabi lies juicy, crisp flesh. Kohlrabi can be cooked or left raw, and it makes delicious oven-baked fries. It can also be made into a mash, pureed into soup, or sliced thinly and added to salads. Combine kohlrabi with any of your favorite spices and herbs. Ginger // Similar to beets, ginger is a powerhouse root due to its natural antibiotic, anti-inflammatory, and detoxification properties. With a sweet, spicy, yet creamy flavor, ginger can be used in a large variety of foods and drinks. Ginger is most often used in ethnic food alongside coconut milk and a variety of vegetables, but its uses are virtually endless. Feeling like you’re getting a cold? Drink a kale-ginger detox smoothie and you’ll feel like a million bucks! Onion & Garlic // There is debate as to whether or not onions and garlic are true root vegetables because they are bulbs and do not grow as deep as most of the other roots. Onions and garlic are widely used in cooking, as they both add a great deal of flavor to any dish, both raw and cooked. Both are considered to be heart-healthy veggies, increase circulation, and act as an anti-inflammatory. How do you prepare root vegetables? Roots can be prepared every which way. Experiment and discover what your favorite cooking methods and flavor profiles are! Raw // Because root vegetables are hard and have an earthy flavor, they are most palatable when cooked. For those who prefer leaving their vegetables raw, carrots, beets, radishes, and jicama are good choices for slicing thinly or grating and tossing with dressing and/or other vegetables and fruit. Steamed/Boiled // Steaming or boiling root vegetables is a great way of prepping them in order to mash or puree them. Mashed celery root or yams make healthful replacements for mashed potatoes, and any root can blended up into a creamy root soup. Roasted // Roasting any type of vegetable cultivates flavor and texture. Chop up your favorite vegetables, drizzle them with olive oil, sprinkle them with spices, and roast them in the oven. Roasted root vegetables are an easy and delicious dish, and they’re a guaranteed way to get the vegetable-averse to eat and enjoy their veggies. You can also thinly slice roots, lay them on a baking sheet, and roast them into root chips. Sautéed // Making a vegetable sauté or stir fry is a great way of preparing root vegetables. This is a relatively quick and easy cooking method, and all sorts of flavors can be added to the dish. When cooking with other types of vegetables besides roots, sauté the roots first, as they take longer to cook than other vegetables. Grilled // Roots can be peeled, thinly sliced, brushed with oil, and grilled along with other summer vegetables. This adds a smoky flavor into the roots and softens their earthiness. Hopefully those of you who were once on the root fence are now sitting cozy on Team Root. Good luck on all your root adventures, and remember: those who root together stay together. Drizzle root veggies with coconut/olive oil and mix well to coat each vegetable lightly with oil. Sprinkle with salt, pepper and herbs. Bake uncovered for 25 to 35 minutes until vegetables are tender and golden brown, checking every 10 minutes to stir and make sure veggies are not sticking. Juicy Hot Tip Alert: Any combination of root vegetables will work. Roasting only one kind of vegetable also makes a nice side dish.